At present, there is one large civil airport - Jiangbei International Airport and two mini airports - Wanzhou Airport and Qianjiang Airport in Chongqing City. As the main airport, Jiangbei International Airport operates a total of 260 air routes from and to 155 domestic and international cities, covering 110 provincial capitals and major tourist cities throughout China. With around 60 international air routes, an air network reaching Southeast Asia, South Asia, Japan and South Korea, Europe and North America has been gradually shaped. Wanzhou Airport currently operates only one international route to Pattaya in Thailand and 18 domestic routes, connecting with Beijing, Shanghai, Guangzhou, Shenzhen, Xi'an, Xiamen, Guiyang, Nanjing, Tianjin, Haikou, Lhasa, etc. In the Qianjiang Airport, air routes connecting to Beijing, Shanghai, Kunming, Guangzhou, Hangzhou, Ningbo, Haikou, Chengdu and Xi'an have been opened. How much does it cost for flights to China Chongqing from overseas destinations? There exists large discount space in air tickets, especially international tickets. The air travel from Tokyo on an economy class seat may cost around CNY 3,000 - 12,000. The fare flying from London can be up to CNY 25,000 at most or as low as about CNY 5,000. Some travelers from Los Angeles may spend about CNY 4,000 - 20,000 on this trip. You can get real-time ticket prices via the search box on page top. 1. We suggest you trying not to travel during summer or winter holidays, Chinese traditional festivals and weekends because the fare is generally higher than usual. Also, the low season of Chinese domestic flights is from November to next March, with discounts of 40% to 70%; the hot season is from April to October, with discounts of 60% to 80%. 2. Comparing with Beijing and Shanghai, there are less international flights to Chongqing, leading to less chances of getting a discounted ticket. If it is cheaper to transfer in Beijing or Shanghai and your travel time is not so tight, you can try to make a transfer. For example, the fare of the direct flight from London at the time of written is about CNY 8,500. If you make a transfer in Beijing, the total fare is about CNY7,500 and you will save about CNY1,000. 3. You can pay attention to the fare changes on the official websites of airlines, especially cheap airlines. They will release discounted tickets in low seasons or on Membership Days. Also, you can make use of various APPs to compare the fares and choose the cheapest one. But remember to see the luggage limit of the special tickets. 4. You are advised to make reservations 1 to 3 months in advance in the normal condition so that you may get bigger chance to buy the special tickets with large discount. Domestic flights should be booked at least 1 week ahead and international ones at least 2 weeks in advance in case they are sold out. 5. Making reservations of the return ticket together also will help you save much money. It is about 21 kilometers (13 miles) northeast of Chongqing city center in Lianglu Town, Yubei District. The airport consists of three terminals: T1 has been suspended for interior renovation; T2 is for domestic flights of Sichuan Airlines, West Air, China Express Airlines and Spring Airlines; T3A is for domestic flights of other airlines and all international flights. Tourists who go to the downtown or other areas within the city can take the airport shuttle bus, the Metro Line 3 and 10, as well as the long-distance buses to nearby districts and cities. Wanzhou Airport, also known as Wanzhou Wuqiao Airport, is located on the south bank of the Yangtze River in Wanzhou District, about 15 kilometers (9 miles) from the central Wanzhou District and about 270 kilometers (168 miles) from Chongqing City. There is only one terminal in service and the new Terminal 2 is under construction. The transport between downtown and this airport is not convenient. As the only civil airport in southeast Chongqing, this small airport is located in Zhoubai Street, 3 kilometers away from Qianjiang District and 280 kilometers (174 miles) from city center. So it is also called Qianjiang Wulingshan Airport or Qianjiang Zhoubai Airport. What terminal does Air China use in Chongqing Airport, Beijing Capital and Shanghai Airports ? It uses Terminal 3 in Chongqing Airport, Terminal 3 in Beijing Capital Airport and Terminal 2 in Shanghai Pudong Airport. In Shanghai Hongqiao Airport, both T1 and T2 are available. I have a ticket on 23rd of December 2017 from London to New-Zealand and will change in Chongqing. But I don't have information about the terminal of Chongqing. I have got an e-mail. In this email it was written Chongqing Terminal: not available. You will use T3 in Chongqing Airport, GS7966 will land at T3 and GS7957 will departs from T3 as well. How many flight from Chongqing to Daocheng? But i can't book flight. Do you have any suggesetion? We are a group of 5 persons from Germany und we will travel to chongqing from May 27 to June 6. We would like to fly to Lhasa for 1 - 2 days in that period. Is it possible to book flights spontaneous? You could book the ticket online, this website offers booking service. 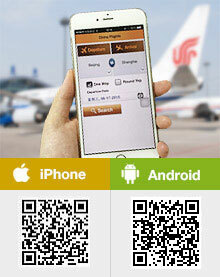 What is flight schedule for Chongqing to Jiuzhaigou? What is cheapest way to travel-- bus, train or air? There should be a flight at 12:20 in the noon and one departs at 14:00. There is no rail service in Jiuzhaigou. Bus should be cheaper but take much longer time.